Today’s post addresses a question that has tons of differing opinions depending on who you ask. Let me start this post by saying I am no expert in sharpening hair scissors, by any means! 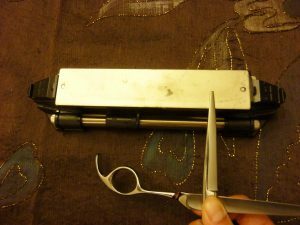 I have used some of the methods below and I can tell you that they work fine for me, in somewhat restoring my dull scissors. Yes, it won’t be the same as having it sharpened by a professional service, but it works well enough to restore my $30 pair so that I can continue to cut my own hair every month! Which brings me to my next point: why do you wish to learn how to sharpen hair scissors? If you’re like me and have a pair to trim and maintain your hair, then definitely use the methods below. However, if you have hair shears upwards of $100, I’d strongly recommend that you consult a professional service. Instead of ruining your investment, It’s best to pay the price and have it serviced by someone who is an expert at what they’re doing. And I seriously mean this! You’ll thank me in the long run. Anyways, assuming you’re working with a fairly inexpensive, standard pair of shears, keep reading to learn more! If you’ve been following my blog for sometime now, you’ll have heard me preach this before: know your tool before working on it. 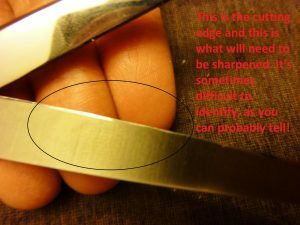 In this particular case, you will want to know more about your scissors’ cutting edge before you try to sharpen. If you wanted to sharpen an axe or any other tool for that matter, it’d be the same idea basically. Always spend some time and look at the tool and try to visualize in your mind what part of the tool does the cutting. And once you have a basic idea, you’ll know exactly what needs to be sharpened and how to go about it. 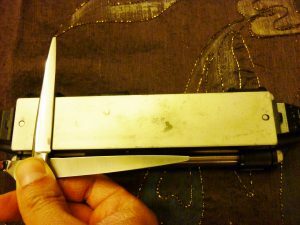 Below are some pictures of my cutting edge; This is what I will be sharpening. Below is an example of a scissor I use for kitchen work. It’s actually much easier to see the edge on this one. Scissors are different from knives, and sharpening them can be a little more difficult. It’s important to get a good grip if you’re hoping to sharpen your scissors as a bolted pair. If you find it difficult, unbolt and sharpen each pair separately. Now that you have a good balanced grip, drag the blade against the stone ensuring you maintain a similar angle to the edge. The sharpening angle will vary from shear to shear. 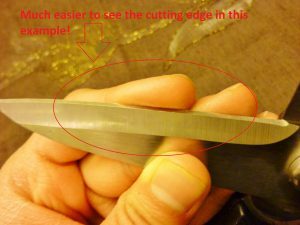 Important: Doing this incorrectly can cause you to dull your edge instead of sharpening it. I can tell you this from experience. My advice to you is to please practice on a cheaper pair of scissors first. Follow through and finish on the other side. Only apply minimum pressure, and repeat for 5-6 passes. Drag The Scissor Blade Against The Abrasive. Make Sure You Practice With A Cheap Pair First! Repeat the same procedure for the other scissor blade. I would like to mention that this is my least favorite choice on how to sharpen hair scissors, simply because it’s very easy to mess up if you’re not comfortable using sharpening stones. Methods 2 and 3 are definitely easier to do, and you’re less likely to screw anything up. This is a hugely popular option simply because of how easy it is to do. How does it work? It’s simple! You cut a large section section of aluminum foil (preferably heavy duty), and fold it many times so you end up with basically a thick, fairly small sheet of aluminum. All you need to do now is cut as many long strips of aluminum that you possibly can. And ta da! That’s all there is to it. Below is a video demonstrating this in action (all credit to Eclectic Knowledge). Important: Cutting through aluminum doesn’t necessarily sharpen hair scissors; Instead all it does is polishes it and removes burr. The amount of metal removed is minimal and negligible. This isn’t the case when using a stone. This is an even simpler method than the one above. Get yourself some fine grit sandpaper and simply cut through in any which direction. As with the foil, I prefer to cut along the length, thereby forming strips. I then cut the strips across into tiny little pieces. Just like the foil, this method does not remove steel from your shears, but polishes and hones the edge. This method is a variation of #3, where instead of cutting into sandpaper, you will actually abrade against it as you would with a sharpening stone. It does require some skill and technique to do this properly, and it will remove metal so proceed with caution. Below is a video demonstrating this technique on a normal pair of shears, but the same could be applied to sharpen hair scissors (all credit to theoverengineer). I mentioned this earlier in this post, and I’ll repeat it again because it’s so important. These methods are sufficient for cheap shears that you wouldn’t necessarily mind experimenting on. If you own a pair of expensive hair shears, and you’re unsure of what to do, then here’s my advice to you: do some research and find a professional service whose expertise is to sharpen hair scissors. Knife and scissor sharpening are two different things entirely. That’s why you cannot trust giving your scissors to a professional knife sharpening service. Don’t make this rookie mistake. If you can’t find a good professional service in your city, consider online options where you send your shears via post to get sharpened. Some places offer free post, so keep an eye out for this. Lastly, If you do intend on following these methods, let me warn you that methods #1 & #4 will remove metal, so please be sure you understand and identify your edges before proceeding. Having said that, methods #2 & #3 are simple and less likely to alter your edge. These two are best for newbies. That’s it from me! I hope you enjoyed reading, and if you have any questions please let me know!